OK, I’m late on this post but I have a signed excuse from other technical analysts. 🙂 (at a conference) So let’s catch up here. Looking at the chart of the NASDAQ Composite Index below I think we’re seeing a dichotomy of thinking. The Money Flow indicator at the top shows Distribution, but note how the volume (lower window) is showing less activity (Supply). My thinking is that we’re oversold, in that the market has over reacted in the short term. Thus a bounce (up) is likely. What happens after that bounce / reaction will be important. I doubt if it will make a “higher High” but it could just to fake out the Bears and force them to cover shorts. I’ve also drawn in a parallel trend line to the predominate lower trend line off of the last swing low that penetrated the lower line. Lo and behold . . . it stopped (so far) right at Fridays low (roughly 4130). I’m thinking that 4130 level is going to be an important support level. Breaking that lower trend line was not good, but going below 4130 (on a Close) is pretty damning. It’s the end of the first quarter, so many folks would like to see a price bounce (to make them look less bad) and that may help it along. Overall I still see more weakness than strength. 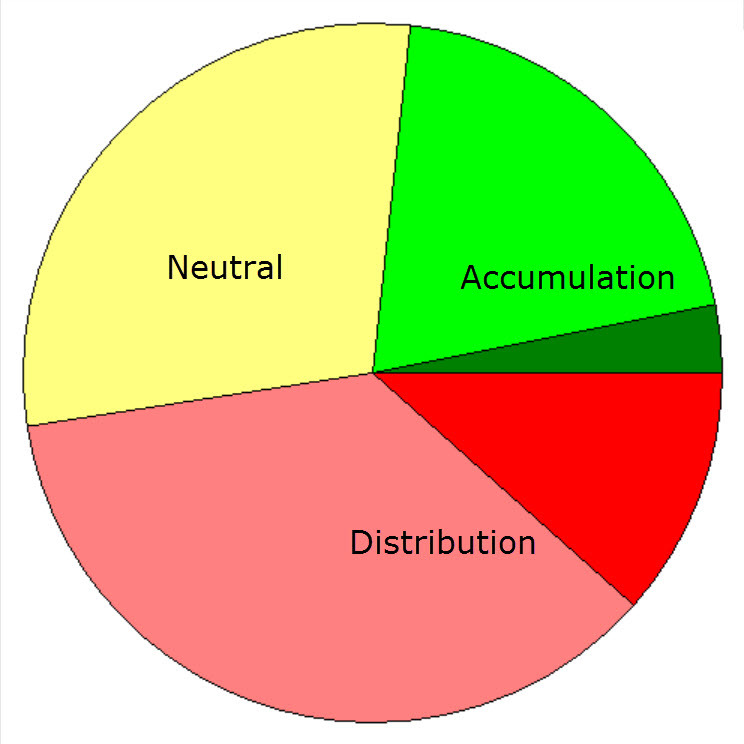 Taking a look at the Accumulation (buying) and Distribution (selling) pie chart below shows a deterioration strength . . . . more red than green. Looks like 23% of the S&P 1500 stocks are in Accumulation, 29% Neutral and 48% is Distribution. I also am seeing very few stocks that pass my “Buy Candidate” scan, so as my stops are hit, I’m staying in Cash to see just where the next trend will be. This Bull market is old and could use a rest, the only question is when it will start. I would not be surprised to see Spring as that season, but let’s not guess at this. Follow your rules and don’t be to in a hurry to put money back into this market. It may not be worthy. Just say’in. price chart by MetaStock; pie chart by http://www.HighGrowthStock.com. Used with permission.